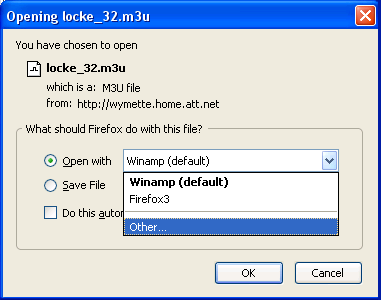 - When you click a link to download a file, the [http://developer.mozilla.org/en/docs/Properly_Configuring_Server_MIME_Types MIME type] determines what action is taken. 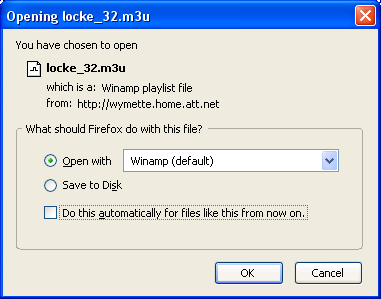 If you see an "Opening <''filename''>" dialog asking if you want to save the file or open it with a specified application, that normally means that no [[:Category:Plugins |plugin]] is installed and enabled that can handle that MIME type and you have not previously selected a download action or [https://developer.mozilla.org/en/Gecko_Plugin_API_Reference:Plug-in_Basics#Plug-ins_and_Helper_Applications helper application] to always use for that type of file. 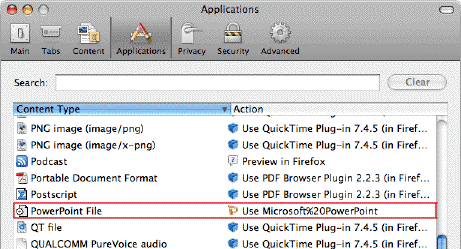 Starting in Firefox 3 and SeaMonkey 2, the "Opening <''filename''>" dialog will also appear if you have selected "Always ask" as the action for the file's content type in your (Helper) Applications options/preferences ([[#File handling in Firefox 3 and SeaMonkey 2|see below]]). 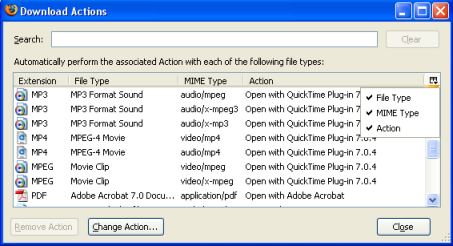 + When you click a link to download a file, the [http://developer.mozilla.org/en/docs/Properly_Configuring_Server_MIME_Types MIME type] determines what action is taken. If you see an "Opening <''filename''>" dialog asking if you want to save the file or open it with a specified application, that normally means that your Mozilla application cannot handle the MIME type internally, no [[:Category:Plugins |plugin]] is installed and enabled that can handle it and you have not previously selected a download action or [https://developer.mozilla.org/en/Gecko_Plugin_API_Reference:Plug-in_Basics#Plug-ins_and_Helper_Applications helper application] to always use for that type of file. 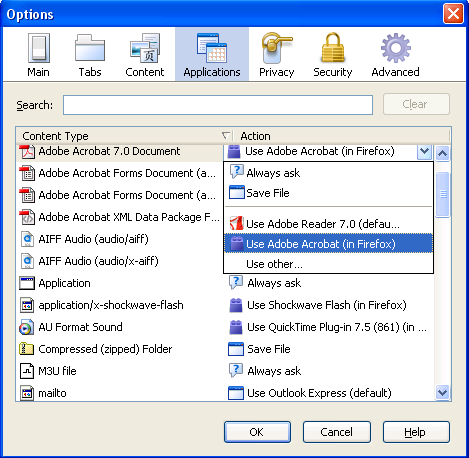 Starting in Firefox 3 and SeaMonkey 2, the "Opening <''filename''>" dialog will also appear if you have selected "Always ask" as the action for the file's content type in your (Helper) Applications options/preferences ([[#File handling in Firefox 3 and SeaMonkey 2|see below]]). 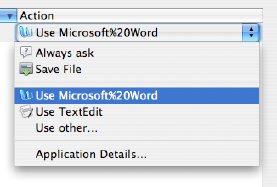 The "Open with" option may already show a default application for the file type. 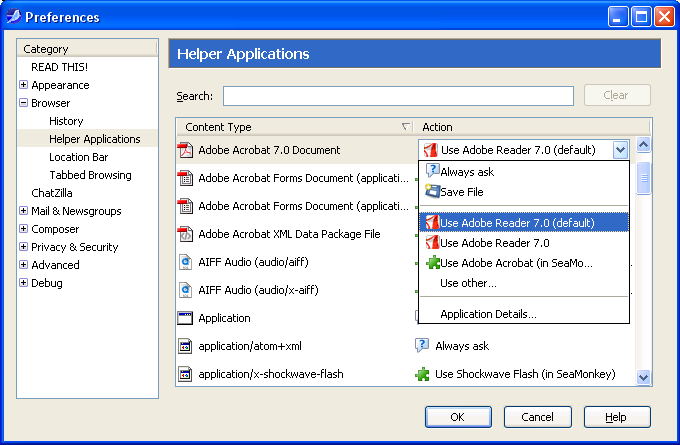 You can choose to open the file with that application, or you can choose or browse to a different application. 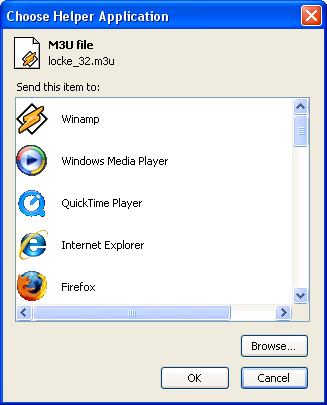 In Firefox, you can use the drop-down menu and click "Other" (shown [http://kb.mozillazine.org/images/Fx3OpenOther.png here]) on Windows to open a file picker or, in Firefox 3, a "Choose Helper Application" dialog, as shown [http://kb.mozillazine.org/images/Fx3ChooseHelper.png here]. 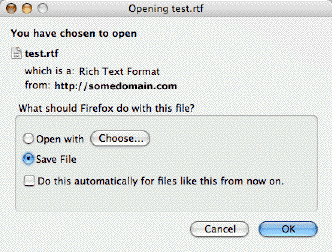 The "Open with" option may already show a default application for the file type. 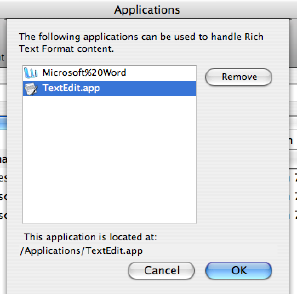 You can choose to open the file with that application, or you can choose or browse to a different application. 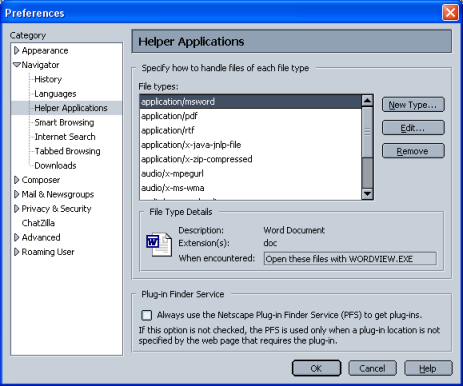 In Firefox, you can use the drop-down menu and click "Other" (shown [http://kb.mozillazine.org/images/Fx3OpenOther.png here]) on Windows to open a file picker or, in Firefox 3, a "Choose Helper Application" dialog, as shown [http://kb.mozillazine.org/images/Fx3ChooseHelper.png here]. In some cases, you may not be able to set an automatic download action. This can occur when a [[Opening_files_using_plugins#Misconfigured_web_server |misconfigured web server]] assigns an incorrect [http://developer.mozilla.org/en/docs/Properly_Configuring_Server_MIME_Types#What_are_MIME_types.3F MIME type], such as "application/octet-stream" (shown above in SeaMonkey 1.x) or if the server assigns "Content-Disposition: attachment" to the file download (shown at right in SeaMonkey 1.x). [http://forums.mozillazine.org/viewtopic.php?t=356337&start=30] [https://bugzilla.mozilla.org/show_bug.cgi?id=285976] When this happens, the option to always perform the same action will either be "grayed-out" (as shown here in SeaMonkey 1.x) or, in Firefox, selecting the "Do this automatically" option will not seem to have an effect and you will again be asked what to do when you next encounter that file type (see below for [[#Related bug reports|related bug reports]]). There is little you can do in these cases because the problem is at the server end. In some cases, you may not be able to set an automatic download action. This can occur when a [[Opening_files_using_plugins#Misconfigured_web_server |misconfigured web server]] assigns an incorrect [http://developer.mozilla.org/en/docs/Properly_Configuring_Server_MIME_Types#What_are_MIME_types.3F MIME type], such as "application/octet-stream" (shown above in SeaMonkey 1.x) or if the server assigns "Content-Disposition: attachment" to the file download (shown at right in SeaMonkey 1.x). [http://forums.mozillazine.org/viewtopic.php?t=356337&start=30] [https://bugzilla.mozilla.org/show_bug.cgi?id=285976] When this happens, the option to always perform the same action will either be "grayed-out" (as shown here in SeaMonkey 1.x) or, in Firefox, selecting the "Do this automatically" option will not seem to have an effect and you will again be asked what to do when you next encounter that file type (see below for [[#Related bug reports|related bug reports]]). There is little you can do in these cases because the problem is at the server end. 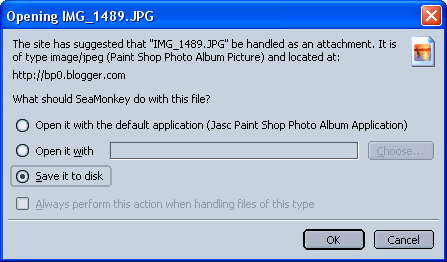 - '''Note:''' the MIME type of a downloaded file, and whether it should be handled as an attachment, is only shown in the SeaMonkey 1.x "Opening" dialog. This information does not appear in Firefox or in SeaMonkey 2. 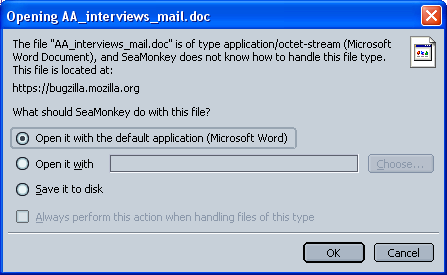 + '''Note:''' the MIME type of a downloaded file, and whether it should be handled as an attachment, is only shown in the SeaMonkey 1.x "Opening" dialog. This information does not appear in Firefox or in SeaMonkey 2.